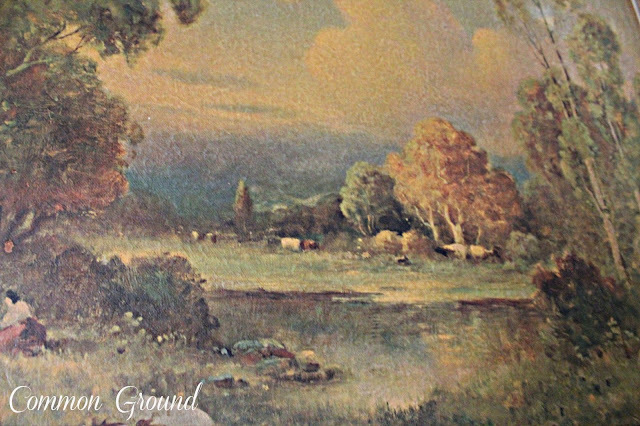 I don't post about it often because it's hard to photograph, and really pretty rustic. We've always wanted a weekend cabin at the lake. But, I don't have one, so this area gets to be the stand-in. Things don't change around too much down here. 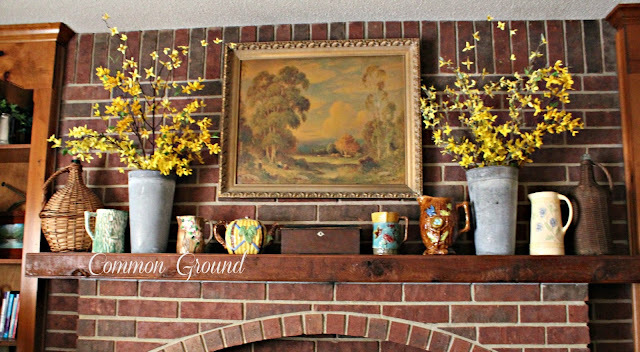 But I do try to keep the fireplace mantel seasonally decorated and the faux flowers in my wicker basket changed out. It's where we hang out to watch tv and spend our evenings. It's functional, cozy, and not "white". It's also where the kids and grandpuppy lounge. and did I mention that it's not white? It's about the same as our fireplace in the living room, which is directly above it, except this room has built in bookshelves on each side instead of windows...and a massive tv and wall cabinet....also wood, which makes it darker. But so much better to curl up with a fire and a good movie. So I enjoy the rustic, lodge-y feel with Pendleton Blankets, a few leather pieces, and a deer mount or two. 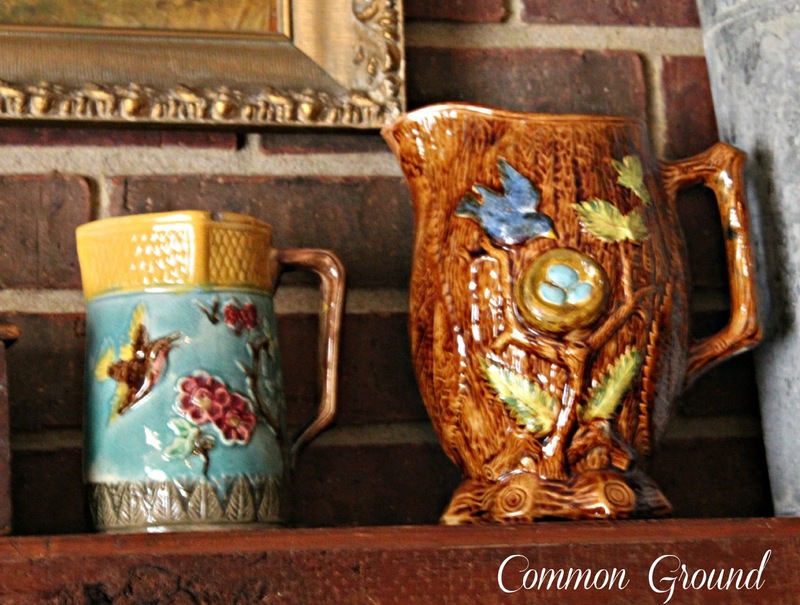 down here with my Majolica pitchers and teapots. 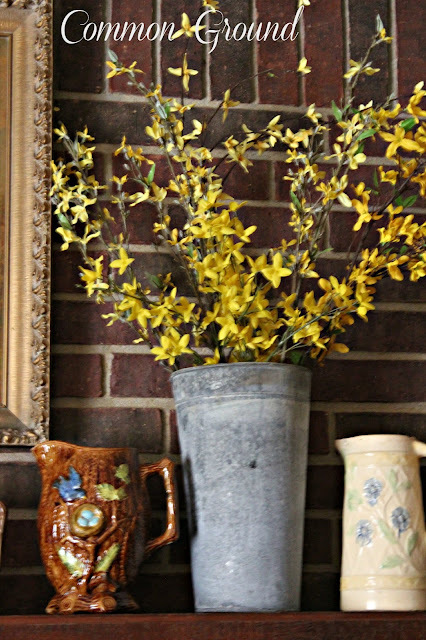 ...and my florist buckets filled with faux forsythia. which brighten things up a little bit. I found this old 40's framed print at the flea, and it's here most of the year. 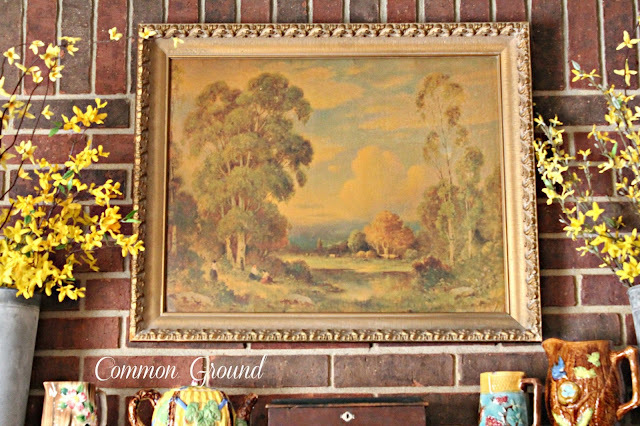 The subtle shades of muted earthy tones, and shabby gold frame blend in with the vintage feel. those are a few cows in the distance. ...love me some cows and sheep in a landscape. and don't forget to bring your blankie. 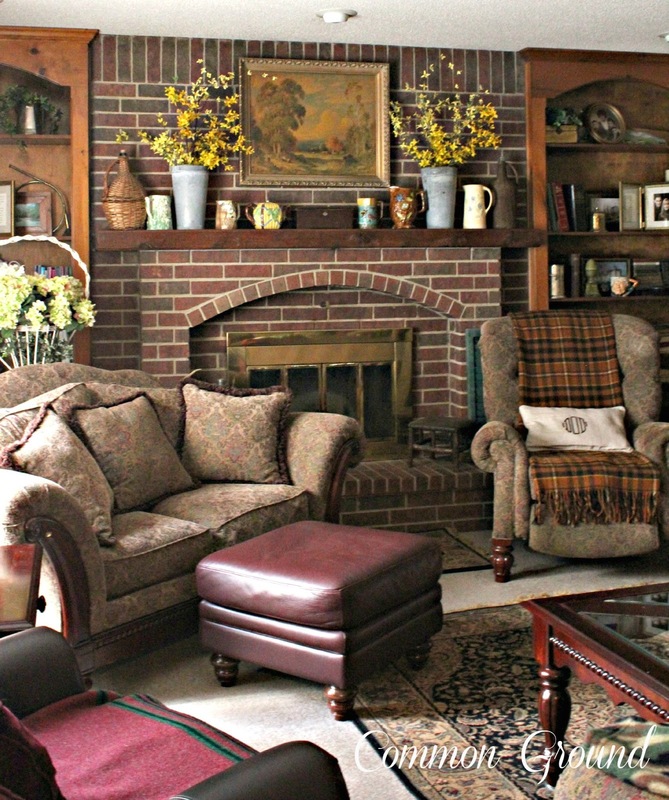 This really is a beautiful, cozy room to curl up and relax in, Debra! You've done a great job making it that way. As always, your mantel is just wonderful...I'd love to find some of those florist buckets, some that I've seen are just too shiny. I am loving this room, esp. since its not all white!! Cozy and comfortable, perfect for family evenings....and you have some splendid pieces of Majolica...!!! Debra I'm so glad you shared this room. It is different but you have such a warm decorating touch you bring to any style. 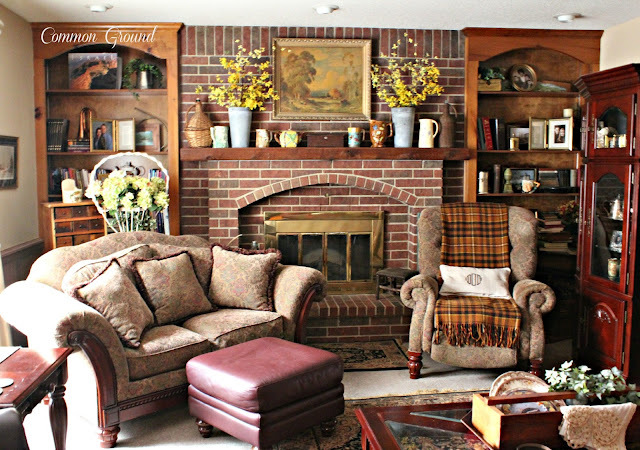 I love this comfy room and I can understand why the kids and grandpup do too. Love, love this room! 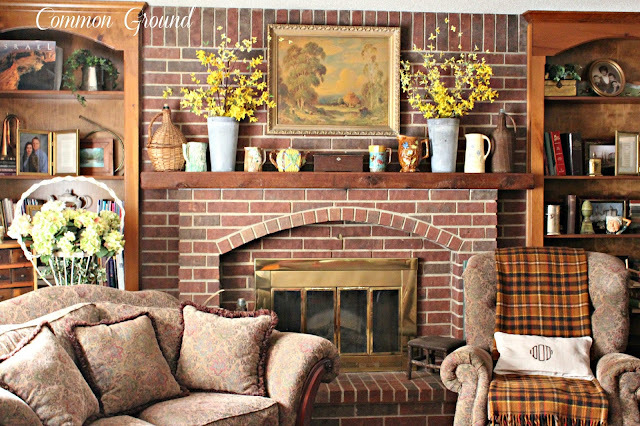 The brick, wood built-ins and your cozy chairs with throws...so warm and inviting! Your Majolica pitchers and teapots are so pretty! Please come share at AMAZE ME MONDAY, like goes up tomorrow afternoon! Oh, wow! You have the best of both worlds..white and not white. :) Love this cozy room. This room is cozy and sweet. I could just curl up down there. Looks like a great family hang out. It's a lovely room, Debra! Very cozy! Debra - It is so different from the rest of your house, however, with your talent and style you have made it into a very cozy and livable room. So inviting. Am so excited! Found me a wooden box this morning at the Flea Market to make me a seed box like yours. Can't wait to get started. May I take a "rain check"??? Two full days until my presentation and still much to do to be ready!!! 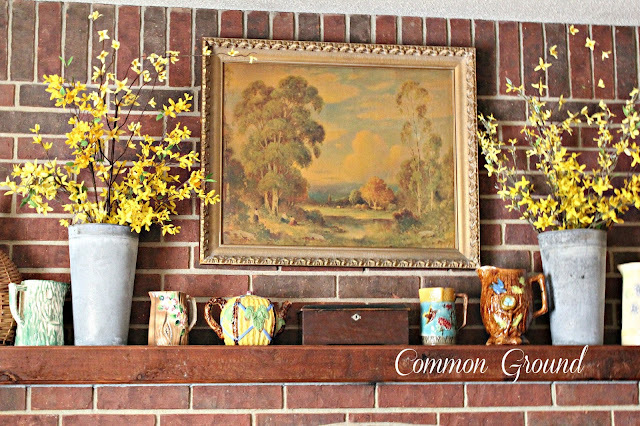 Love the print over the mantle and the Majolica has me drooling!!! So glad someone besides me still enjoys a brick and wood mantel space. I feel so cozy in my den. Yours looks like a great place to sit and talk for hours. It looks like a great room to rest and snuggle up with a blanket to read a book! I love your majolica pieces. Very pretty touch. I love masculine spaces. It's especially nice when you live n a cold climate. This is a room I would tend to gravitate to. 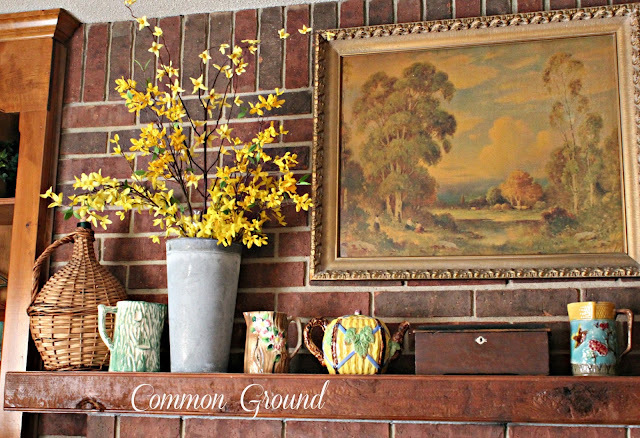 I love how you arranged the mantel. Oh I could snuggle up with a good book in that room! Love the look for your Mountain cabin:) Have a blessed Sunday dear Debra, HUGS! Very inviting for sure! The brick work on the fireplace is so lovely especially the arch. Your spring display on the mantle inspires me to get going on mine! Having a room where we don't have to be fussy when the family are all together is a must! I could curl up on that loveseat with my blankie with no trouble at all! Thanks for sharing! Have a sweet Sunday! The room looks so cozy, I could curl up with a coffee and a good book. Such a different look from all your white. This room does look snugly. 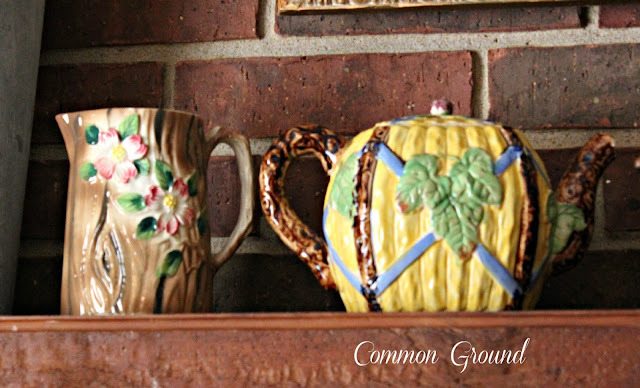 I loved seeing your majolica collection! Very cozy, and the perfect place for the family to relax. I think it's so nice that you have such a different spot to enjoy! I think we all have different styles we like but usually don't have a totally separate area where we can indulge a totally different look! Lucky you! Very cozy! What a cozy nest you've created Debra. I'm really liking the rustic feel and all your gorgeous accessories. What a comfy atmosphere and room. Debra, this would be a favorite room for me. I like the cozy feel. I have my favorite tartan blankie in hand. I'll be right over. Just had to come back to thank you for sharing at Amaze Me Monday! I do believe I could curl up in that chair and not move all day...really, really love this room! What a cozy, comfy looking room! Great place to hang out with family and friends. Que delicia todo lo que siempre veo aquí, maravilloso para mis ojos,gracias Debra,congratulaciones.